Hi everyone! It's Melissa from Catherine's Creative Team. I'm honored to be guest posting for her today. I wanted to share a card I created using products from the All That Jazz release. To recreate this design, start by cutting a panel of white card stock to 3-3/4 x 5″. Mask off a rectangle in the middle of the panel using your favorite masking paper, tape, etc. Using an ink blending tool, sponge the top third of the rectangle using Seafoam ink, the middle third with Skylight ink, and the bottom third using Spruce ink. Continue adding ink until you achieve a smooth transition between each color. Once the ink blending is done, remove the mask. Use a straight edge and fine tip black pen to draw a simple frame around the rectangle. Mask off and stamp the “You Are” words from the You Are Loved sentiment in the Grateful Hearts stamp set just below the halfway point of the rectangle using Midnight ink. Set the panel aside for now. Using white card stock, die cut the Awesome word die five times. On one of the die cuts, sponge some Seafoam ink on the top half of the word. Next, apply some VersaMark ink on the lower half of the word. To avoid having too harsh of a line, lightly tap the upper edge of the VersaMark ink with a sponge dauber or your fingertip. Apply gold embossing powder, then heat set. Adhere all of the word die cuts together finishing with the embossed layer on top. 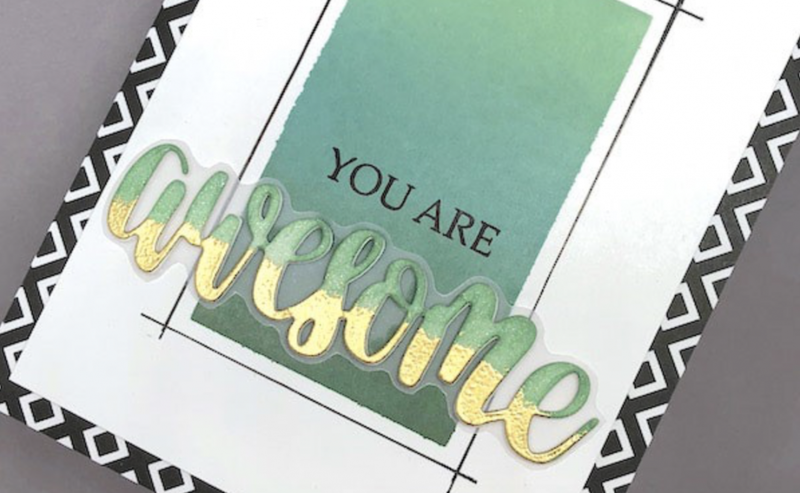 To help set the die cut words off from the background, create a shadow layer using Catherine's absolutely AMAZING new vellum card stock. 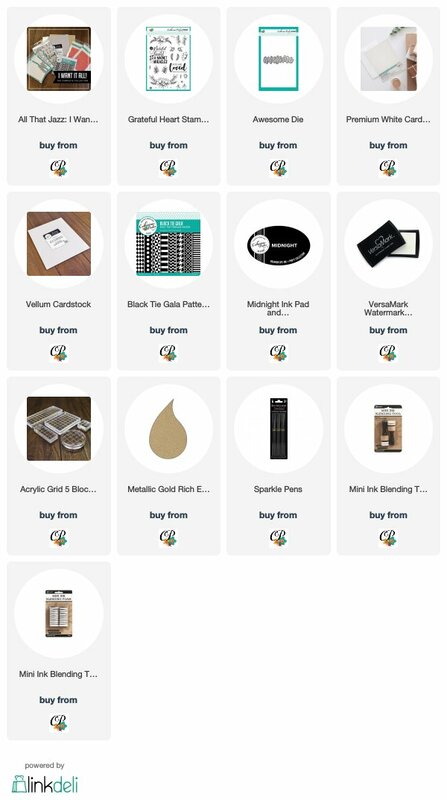 If you've ever searched for a super heavy weight vellum, look no more! This is the heaviest vellum I've ever used and I LOVE it! Create the shadow layer by placing the Awesome word die on the vellum and tracing around the outer edge with a pencil. Fussy cut the outline then erase any remaining pencil marks. Adhere the stacked die cuts to the vellum shadow. To assemble the card, adhere a piece of patterned paper from the Black Tie Gala paper pad to a top-folding card base. Add the white panel centered over the patterned paper using a dimensional adhesive then adhere the word die cuts just below the You Are stamped sentiment. For a final bit of bling, add some Clear Overlay Sparkle Pen to the upper half of the die cut words. The sparkle looks so great next to the embossing! I really hope you've enjoyed my card today.